Your favorite holiday side dish is now a delicious Sweet Potato Soufflé Dip with toasted marshmallow. Dip in some cinnamon graham cracker sticks for a complete treat! If you haven’t cooked your sweet potato, start by steaming it for 5-10 minutes in the microwave or another type of steamer. 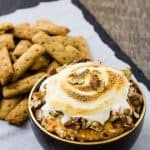 In a medium bowl combine sweet potato, brown sugar, cream cheese, cinnamon, allspice, and 4 ounces of the marshmallow cream. Mix to combine by hand or with a hand mixer. When ready to serve, top with the remaining marshmallow cream. Toast with a small kitchen torch or place under a broiler until toasted. Serve with cinnamon graham crackers or sticks.